After over fourteen hours of play, including a two-hour heads-up match, Kenny Hsiung is the winner of Event 48: $3,000 Limit Hold'em. Stephen Hung was the first player to be eliminated from the final table when his ace-ten was out-raced by Mitchell Davis' pocket nines. The board ran out , and Hung's day was finished. 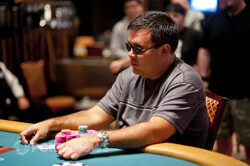 John Myung was the next player to bow out, followed by Davis, who started the final table as the chip leader. Davis took a couple of hits, including a big one against Dwyte Pilgrim, and was busted by Hsiung, who assumed the chip lead. Matthew Woodward, and Pilgrim were the next two players eliminated. 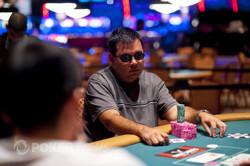 Pilgrim, who was down to one big blind on Day 2, climbed all the way to the top of the chip counts at one point during the final table, only to bust at the hands of Berende. Berende was still short however, and couldn't get anything going during four-handed play. Hwang did him in with against the of Berende on a flop of . The gave Berende outs, but the bricked on the river, eliminating him from the tournament. Hsiung began pulling away as John Virtue began sinking, and Virtue was crippled when Hsiung turned a flush against Virtue's flopped set. Virtue was eliminated the next hand, and was off to the cage to collect $76,244. 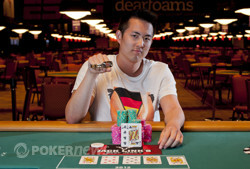 Congratulations are in order to Hsiung, who considers himself a limit-hold'em specialist. He'll take home $165,205, along with the WSOP gold bracelet. Robert Hwang had the button, and raised. Kenny Hsiung called, and the flop came . Hsiung led out, Hwang raised, and Hsiung called. The turn was the , and Hsiung slowed down, check-calling a bet. The river was the , and Hsiung checked again. Hwang bet, Hsiung check-raised, and Hwang tank-called. Hsiung tabled for a rivered straight, and Hwang flashed his rail a before folding. Robert Hwang had the button, and raised. Kenny Hsiung defended his big blind, and the flop fell . Hsiung checked, Hwang bet, Hsiung raised, Hwang re-rasied, and Hsiung capped it. Hwang called. The turn was the , and Hsiung bet out, moving all in. Hwang called. The river was a deuce - the - and Hsiung secured the double up. "Sweep the leg!" Hsiung's rail yelled. 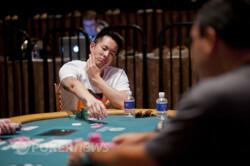 Kenny Hsiung raised with the button, Robert Hwang defended hid big blind, and the flop fell . Hwang led out, Hsiung raised, and Hwang called. Hwang led again after the turned, Hsiung raised again, and Hwang called. Both players checked after the fell on the river, and Hsiung had queen-high. Hwang showed for tens and deuces, and won the pot. Robert Hwang had the button, and raised. Kenny Hsiung three-bet, and Hwang called. The flop fell , and Hsiung led out. Hwang called. Hsiung led again after the turned, Hwang called, and the completed the board. Hsiung checked for the first time, Hwang bet, and Hsiung check-raised. Hwang released, and Hsiung raked in the pot. Kenny Hsiung raised with the button, Robert Hwang called, and the flop fell . Hwang check-called a bet, and the turn was the . Hwang led out, Hsiung raised, and Hwang made it three bets. Hsiung released, and Hwang took the pot. Kenny Hsiung had the button, and raised. 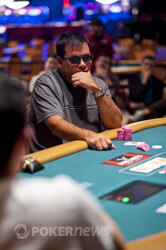 Robert Hwang three-bet, Hsiung called, and the flop fell . Hwang led out, and Hsiung called. The turn was the , Hwang led again, and Hsiung called. Hsiung called one more bet once the completed the board, and Hwang tabled for kings full of nines. Hsiung mucked. "Nice thin-value bet!" someone on Hwang's rail yelled. Robert Hwang had the button, and raised. Kenny Hsiung called, and the flop fell . Both players checked. The turn was the , and Hsiung led out. Hwang called. The river was the , and both players checked. Hsiung tabled for ace-high, and retook the chip lead. Robert Hwang raised with the button, Kenny Hsiung called, and the flop was . Hsiung checked, Hwang bet, Hsiung check-raised, and Hwang called. The turn was the , and Hsiung led out. Hwang called. Both players checked after the fell on the river, and Hwang rolled over for a pair of sevens. Hsiung mucked, and Hwang is now the chip leader. Kenny Hsiung had the button, and raised. Robert Hwang called, and the flop came . Hwang checked, Hsiung bet, Hwang raised, and Hsiung re-raised. Hwang called. The turn was the , both players checked, and the fell on the river. Hwang led out, and Hsiung tank-foled.